Prior to the unveiling of Civil War, Captain America appeared as ‘Serpent Society’ as a placeholder/joke. In classic Marvel Studios fashion, the company held a special event today in order to announce not only a new casting; but also their ENTIRE Phase 3 line movie up until 2019. Though surprisingly, some of these revelations started as rumors stretching as far back as San Diego Comic Con earlier this year. So what was announced; and does this mean that we should believe rumors more often? Let’s find out in this full recap and analysis of today’s Marvel Studios special event. *Special Thanks to everyone at Marvel.com who live blogged this event, especially Patrick Cavanaugh who did a stellar job of transcribing. Though we got a lot more than just release dates for these films. Some were given direction as well as some hints as to where they would go next. Now whereas some are self-explanatory and need only a quick recap, others are worth a little more going into. For starters, not much information was given on Doctor Strange aside from confirmation that Scott Derrickson is still set to direct it. As for casting, Feige promised that we will find out “sometime before the release of the movie”. As for the sequel for Guardians of the Galaxy, no name has been given yet and with James Gunn not present Feige declined to talk about any ideas for it. Additionally, when asked about a standalone Hulk or Blackwidow film, Feige said that nothing are in the works right now but Hulk will continue to appear with the others and that Black Widow is very key role in the stories they have planned. Now for everything else, which requires its own section. We already had an idea this might happen when it was announced that Robert Downey Jr would play a big role in Captain America 3. 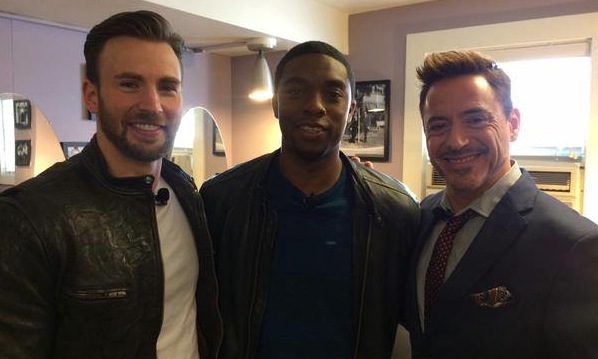 Well we got confirmation today when both Chris Evans and RDJ took the stage after an Avengers: Age of Ultron clip was shown with the two in a very heated argument – learn more about that clip here. Though with the news of Civil War happening in the films, many fans familiar with the comic book storyline are actually very misinformed about what to expect. Many feel that the film would be an awful adaptation of the comics because there aren’t enough heroes and Spiderman – who plays a big part in it – still belongs to Sony as far as movie rights go. Though again, if this is how you feel then you are missing what Civil War actually means. Feige confirmed that this won’t be the movie version of Marvel Civil War; but rather would tell the tale of the Civil War about to take place in the CINEMATIC universe. There has been a lot of unrest in the MCU since S.H.I.E.L.D. turned out to be Hydra; and that unrest will grow through Avengers: Age of Ultron. Even in the original The Avengers we saw mistrust of heroes and who they answer too. The governments of the world might not care about secret identities; but they will want regulation; and that is what the MCU’s Civil War is going to tackle. Once again, this isn’t about adapting the Marvel Civil War comic to film; but rather telling the story of the new Civil War that is about to occur in the Marvel Cinematic Universe continuity. Another film title that has been rumored since the days of San Diego Comic Con, Thor: Ragnarok makes sense not only from a comic standpoint; but also a mythological standpoint. If you know anything about Norse mythos, you know that Ragnarok plays a huge role in it and is usually the end of it where all heroes die in a heated stalemate with various monsters. Will Thor: Ragnarok follow the mythos or the comic closer? The answer again is that – like Civil War – it’ll be its own story with various references to both source materials as well. When we last saw Loki, he had taken Odin’s throne – possibly by killing him. In Agents of S.H.I.E.L.D., we learned that he – or rather Odin – wanted to recruit the enchanting Lorelei so we know Loki has something up his sleeve. Whether Ragnarok will result from his mistake or he will directly stand against Thor remains to be seen. I personally hope that Loki does stand with Thor in the end – and maybe against Thanos in Avengers: Infinity War – ; but it WAY too soon to hypothesize anything with almost 3 years until the release date. Though I will predict this: With one of the Infinity Gems locked in Asgard, a massive all out attack on Asgard could serve the purpose of how this Gem lands itself into Thanos’s hands – especially with it being less than a year away from the release of Avengers: Infinity Wars (Part 1). If you’ve been following my articles, then you should not be surprised in the slightest to hear about Black Panther being announced. Between all the hints that Wakanda and vibranium will come into play in Avengers: Age of Ultron; and now the possibility of Ulysses Klaw being around too, it just makes sense. Additionally, Feige admitted that Black Panther was one of the films he’s asked about most. 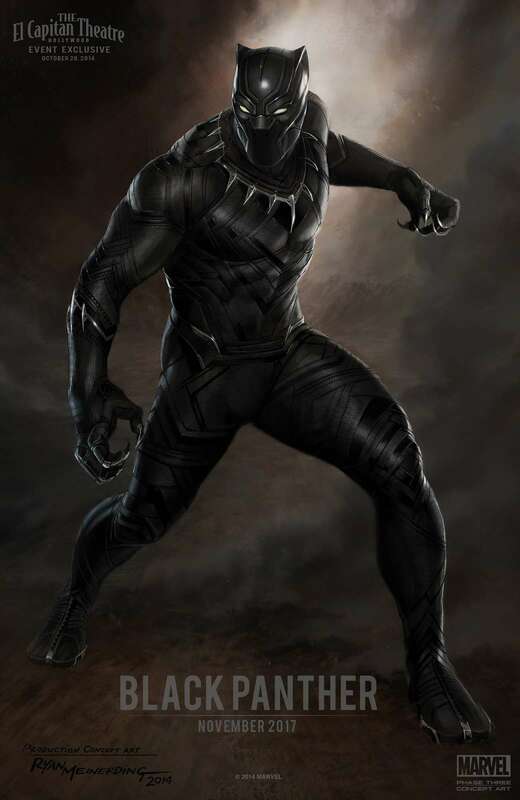 Though we won’t have to wait completely for November 2017 as Black Panther will be introduced – and be in full costume – for Captain America: Civil War. This makes tremendous sense since Cap and Black Panther always had the utmost respect for each other in the comics; and considering Captain America: The Winter Soldier introduced some fan favorites itself – Falcon, Winter Soldier. As for who will play T’Challa, Chadwick Boseman has been casted. I’m not too familiar with his past roles; but judging from his brief time on stage with Evans and Downey, I think he’ll do just fine. Captain Marvel – MISS Marvel To You! 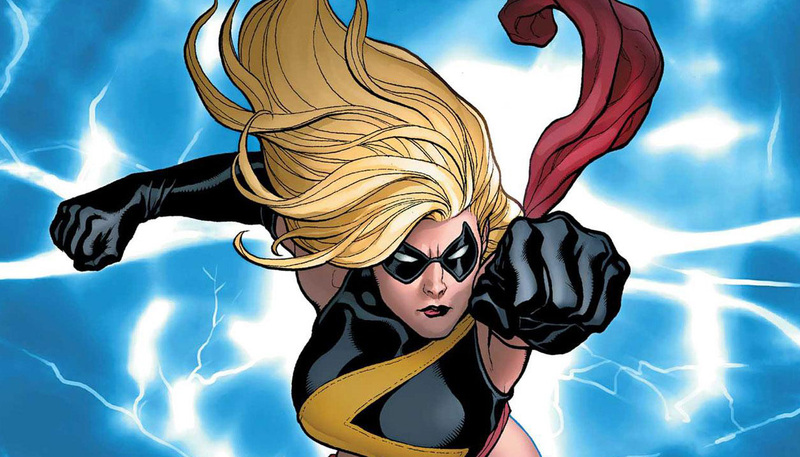 There’s been a lot of Marvels (character name) in the Marvel (company) universe; but the focus of the 2018 film Captain Marvel will be on Carol Danvers who was the alternate identity for Miss Marvel. This is tremendous news as it’ll be the first female led film in the Marvel Cinematic Universe. Feige exclaimed that “This is the time to bring out Captain Marvel”; and I couldn’t agree more. Nothing is really known about this movie yet; but just knowing it’s got the green light is enough for us right now. There are some rumors that Carol – pre powers – will appear in Avengers: Age of Ultron; but we’ll just have to wait and see how that one turns out. A much lesser known title to be sure; but if Guardians of the Galaxy has shown us anything, it’s that even lesser knowns can become a huge hit for Marvel. Again, nothing is really known about this film yet; BUT Feige did say that we might start finding out sooner than we were expecting. Could this confirm some theories that Marvel’s Agents of S.H.I.E.L.D. is actually setting up for the Inhumans already? It’d be a bit of a stretch since The Inhumans is almost 4 years away; but with Marvel anything is possible. So keep your eyes peeled for some Inhuman Easter Eggs coming pretty soon. Another thing that was rumored fairly recently – perhaps a month ago – was that Avengers 3 would be split into two parts. Whereas this did turn out to be true, much like the Civil War ideas it’s important to not let your preconceived ideas of what “two parters” mean. This ISNT Hunger Games or Harry Potter. This will be the Infinity Wars – plural. Thanos is such a powerful villain that it makes sense for him to be spread out over two films. Though it is as always important to realize that Marvel films play out in real time. Thus the year span between Part 1 and 2 will see Captain Marvel and The Inhumans be released. So there won’t be a pause button at the end of Part 1. Something huge will happen that will call for the bookend moment; and then resume again for the conclusion with Part 2. One quick thing that everyone seems to be missing is that in the Infinity Wars lead up teaser, Loki’s Staff was shown a lot. This pretty much confirms a lot of our theories that the gem in Loki’s Staff is indeed the Mind Gem – or at the very least an Infinity Gem of sorts. The last we saw of it, it was held by Baron Von Strucker so we will most likely see it again in Avengers: Age of Ultron. In the end, some will say that since this confirms many of the rumors we’ve been hearing in the past few months, we should trust every rumor from now on. Though that couldn’t be further from the truth. Yes a lot was confirmed; but also a lot was cast aside as pure fabrication – ie: Planet Hulk, etc. Rumors are well and fine; but you should never given them much credibility until they’ve been actually confirmed. Take the rumors of Doctor Strange casting for example. SO many names have been tossed around – some in the running many not at all – that some people have lost interest completely. With a new rumor out every week, all it does is try the patients of devoted fans and leave us dazed and confused. In the end, this press event was the perfect thing Marvel could have given us. They’ve shown a tremendous love for their fans thus far, so let’s stay with them rather than cause needless rumor headaches.